Since I was a child, I have always had a deep interest, love & fascination with animals. Of course, the cute and cuddly kittens & puppies, the tiny little hamsters and adorable bunny rabbits kept my attention as a young girl, because – well, that’s just across the board in my opinion. As I’ve grown older, and have experienced different parts of the world, my fascination has expanded to other things, like frogs, lizards, birds. Living in Florida is like living in a giant terrarium, the wildlife that surrounds me in the suburbs (or the city, for that matter) is nothing short of breath-taking. 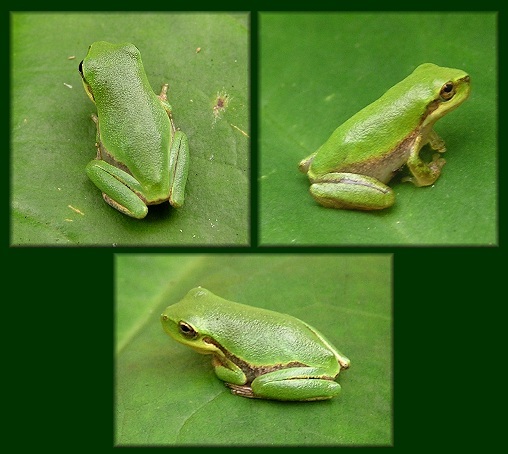 For example, every early Summer the baby tree frogs make their appearance on our back windows & sliding glass doors. I first notice them in the evening, tiny lime green translucent bodies plastered all over the glass awaiting the night fall which is bound to bring the flying insects attracted to our back porch light, or the light escaping from our windows into the back yard. Occasionally, while letting the dog outside to relieve himself, one of my tree frog friends will get confused of the sudden door movement and accidentally find himself on my kitchen floor, so I quickly scoop him up and show him back outside where he belongs. Every few days, I’ll walk by the back door into the kitchen and see one of them in a peculiar or interesting body position and call for the City Boy to come take a look. He usually doesn’t bother – and I feel sorry for him to miss out on the wonder that is Nature. What must THAT be like, to not even care?!? Over the past few weeks, the congregation of tree frogs has dwindled significantly. What used to be 20-30 bodies, is now limited to about 4 or 5 on a good night. Now, this could be due to the fact they’re growing bigger and have gone in search of a larger food supply, or perhaps a good number have died for various reasons, I am not sure. Regardless, I do realize their first Summer is probably their hardest, so I’ve always strived to help out (or work very hard not to HINDER their survival chances) in any way possible. So, today after letting the dog back inside from doing his business I went to pull the sliding glass door closed, and something stopped it from closing all the way. I checked to make sure the curtains hadn’t gotten caught in the track, and then tried again. Still wouldn’t close. On the third try, I really slammed it shut, and just right as the door had left my grasp and any chance of regaining control of the door, I glanced up and saw what I had done. Apparently, one of my almost full-grown tree frogs had been resting between the two glass doors, and the sudden movement of the door jarred him from his position at the top of the doors. He fell onto the door track where I quickly crushed him with the weight of the door being pulled over the track. I honestly cannot even tell you how devastating this was to me. I feel as though I have murdered a friend. Now, here I was: faced with my crime, still not able to close the door (there was about a 1” gap that could not be sealed), and now unable to reach the broken and twisted body of the frog (I only HOPE that he was truly dead at this point) I had been admiring and caring for these past few months. My day, until this point, was productive yet still frustrating and sad. 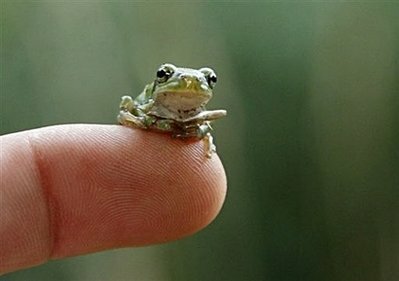 And when I realized my responsibility in this innocent frog’s tragic and painful demise it was too much to bear. I needed consoling, so I thought my husband would know what to say, or could perhaps at least give me an idea how to get the damn door shut. He sounded sympathetic, but I could also hear that “other” part of his voice that couldn’t believe I was sobbing over a “stupid frog”. After several failed attempts I opened the door a bit wider, which exposed the frogs lifeless feet. Taking hold of his feet, I could feel how heavy he had grown (which only intensified my sadness. This frog was one of the SURVIVORS! He had beat the odds and was going to make it!! ), and quickly I was able to free him from the door track and threw him into the yard. The sobbing continued until I laid down on the couch to nap it off. Several minutes later, the City Boy did call back to check how I was holding up. Although some (and probably my own spouse) think it’s ridiculous to care one bit about a dead tree frog, I cannot understand that. I mean, not only is their entire life cycle completely amazing, but they’re really beautiful little animals and they serve a big purpose (my yard has MUCH less mosquitoes right now than there were a month ago, let me tell you!). So while I am still terribly saddened by the loss of my tree frog this afternoon, I am also hoping that my daughter adopts my love of animals and not her father’s indifference to them. I really pray that when I tell her about the different animals and the neat and gross things they do, that her eyes will light up with interest and not glaze over like her father’s do. This entry was posted on Wednesday, July 21st, 2010 at 9:27 pm and is filed under Beasts, Life!!. You can follow any responses to this entry through the RSS 2.0 feed. You can leave a response, or trackback from your own site.